In London, residents of the luxury apartments opposite Tate Modern’s Blavatnik Building (formerly Switch House) extension complain of art goers peering into their homes; down at Tate St Ives, it is a bright white block of flats that conceals the gallery’s new 1,325 sq m volume, so that from its sea-facing frontage you wouldn’t know that much has changed since the building opened to the public in 1993. From the golden sands of Porthmeor Beach, on the exposed, northern side of the Cornish village, Jamie Fobert Architects’ new, blue-green ceramic tiled extension can just be seen poking out behind the beach’s collaged backdrop of piecemeal developments. The cliffside addition has doubled the space for showing art, allowing the gallery to stay open all-year round instead of closing each time the exhibitions changed, but the bulk of the building is hidden below ground like an iceberg. To understand the £20m project, we have to go back to 2005, when Jamie Fobert Architects first won the competition for the gallery’s expansion. The first design was on the site of a nearby car park further up the hill, connected to the original building by a long passageway. With a much greater visual presence, it was met with fierce opposition from locals. The scheme was eventually shelved and following a long period of consultation with the community and investigation into other sites around St Ives, even in nearby Hayle, a second competition was launched in 2012. Fobert won again, beating 6a architects, Amanda Levete Architects, DSDHA and Tony Fretton Architects. A new site had been found when Penwith Housing Association agreed to sell the back half of its site adjacent to the gallery, home to three, low-quality housing blocks, to Cornwall Council, owner of the freehold of the Tate St Ives building. A new block of flats for the elderly would be built overlooking the sea, with space for the gallery extension behind, excavated 15m into the cliff face. The advantage was that there could now be a seamless, flat link between the old gallery and the new. Construction began in 2013. 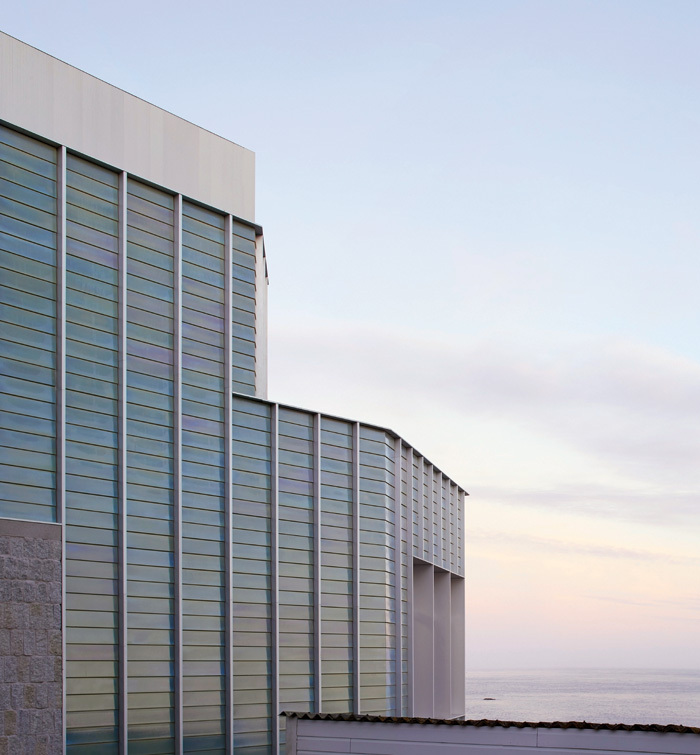 Tate St Ives had reached peak capacity — it had originally been designed by architects Eldred Evans and David Shalev for 70,000 visitors a year, but by 2004, 250,000 people were visiting. Taking inspiration from the town’s white buildings and the cylindrical gas holder which once stood on the site, the curious, off-white, pebbledash gallery shows references to post-modernism, taking visitors around a grand central rotunda looking out to sea and through a disorientating route of narrow stairways and small galleries. It was designed to showcase the — largely small-scale — work of modern British artists with links to the seaside location — the likes of Barbara Hepworth, Ben Nicholson and Alfred Wallis who famously settled in St Ives and had studio spaces nearby. Hepworth left her studio and sculpture garden to the Tate when she died in 1975, the gallery taking over the running of the Barbara Hepworth Museum in 1980, and by 1988 the Porthmeor Beach site had been earmarked for a new gallery. But the only lift for transporting artwork was a tiny passenger lift in the middle of the building and work was stored beneath the drum of the rotunda. Showing large sculptures and contemporary installations in the domestic-scale rooms was becoming increasingly difficult, with the gallery having to close each time it changed an exhibition. The existing gallery spaces have been refurbished and reconfigured by Evans and Shalev to open them up and make the visitor experience more navigable. The reception area has been repositioned to be in front of a stained-glass window by Patrick Heron and a courtyard at the heart of the building has been enclosed to create an education space — the Foyle Studio — for workshops and activities. A new flexible, light-filled studio space for talks and events has been created above, capped by a conical roof that complements the shape of the rotunda and with a terrace looking out to sea. The route through the gallery has been reversed so visitors go through a sequence of five small rooms, documenting modernism in St Ives, before reaching Jamie Fobert Architects’ 600 sq m volume on the same level. From the first gallery the visitor can see right the way down to the new addition, which opened in October with an exhibition of clay sculptures by Rebecca Warren. After the labyrinthine journey — ‘this is a town of tiny rooms’ says Fobert — the vast, 5m-tall, column-free space is a breath of fresh air. 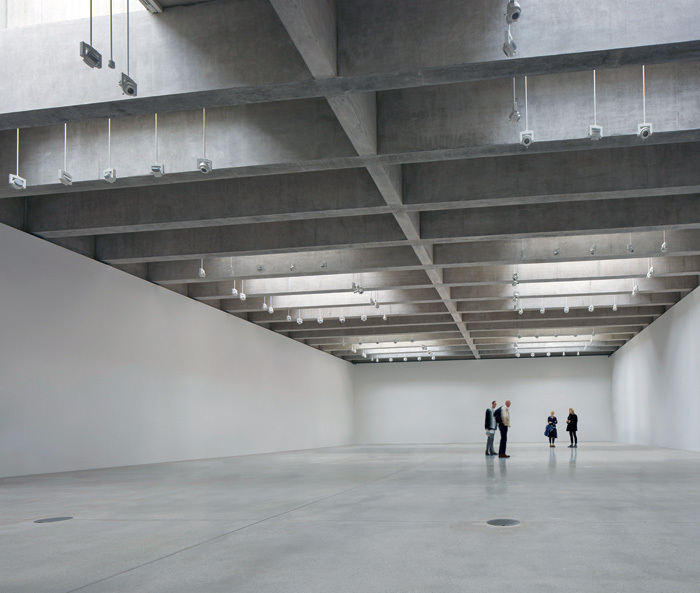 The white, hangar-like space is topped with a series of 1.5m-deep concrete beams that make reference, Fobert says, to Sverre Fehn’s Nordic Pavilion in Venice and Arne Jacobsen’s St Catherine’s College in Oxford, as well as to the timber joists of the humble, lofty, artist studios nearby. The roof lights contain black-out blinds and track lighting, though even on a foggy, grey day, they were redundant, such was the brightness of the natural light coming through. The huge volume can be divided by partitions into six smaller rooms for different shows, while the concrete beams have been designed to withstand hanging heavy work — some the weight of a large elephant — with the addition of steel beams placed across them. 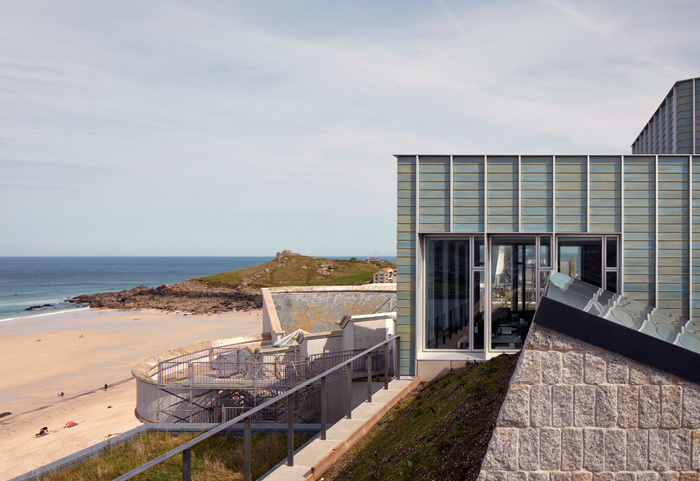 The second layer of Jamie Fobert Architects’ extension is the roofscape above Tate St Ives, which connects a car park behind the gallery with access to the beach. 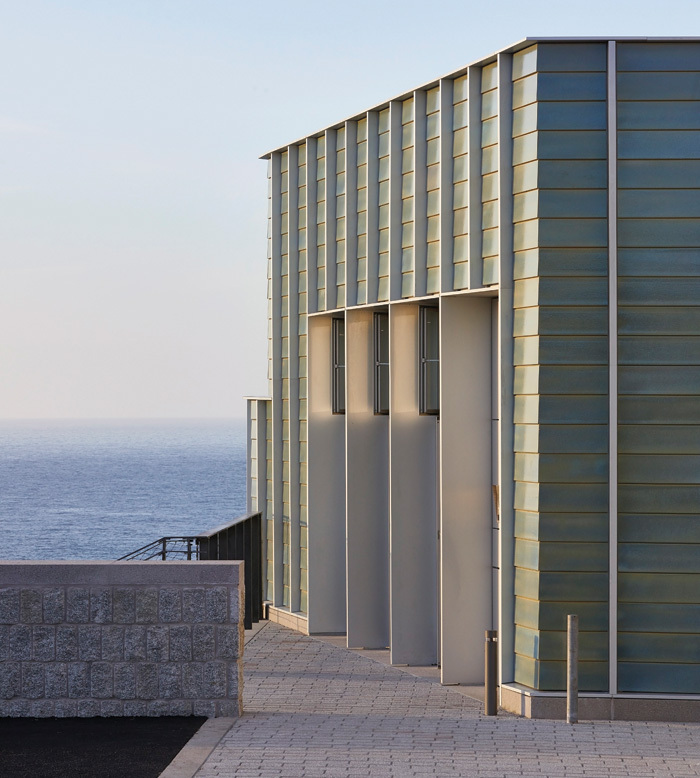 It is completely separate from the gallery, which could be missing a trick, had visitors been able to finish the gallery journey on the roof with breathtaking views out to sea. Some coming from the old town might easily miss this new public space. Steps zigzag between wildflower beds, wrapped in granite, and the six light chambers, which pop out of the ground like old bunkers. Says Fobert: ‘There’s this wonderful language in the Cornish countryside along the coast of post-mining ruins sitting in this natural landscape as fragments of unknown objects, bases, pumps and shafts, which I was really in love with.’ The effect will soften over time, as the native Cornish seedlings grow and take hold. ‘I wanted just to allow the Cornish landscape to creep over the top of the gallery, to blur the edges between where the town ends and the building begins,’ he adds. All else that can be seen of the new building is an iridescent volume that houses offices, staff facilities, storage rooms and a loading bay, which the gallery missed before. Now artwork can be wheeled in directly from the car park and taken down in a large lift to an art handling room and the new gallery space, without the need to traipse through corridors or up and down steps. Disabled visitors can also book in advance to enter this way into what was previously a relatively inaccessible gallery. This section of the building is clad in shiplapped, blue-green ceramic tiles, inspired by the tomb of local painter Alfred Wallis, decorated in tiles made by potter Bernard Leach, in the next-door cemetery. These tiles were made in Germany and glazed in Surrey. Fobert admits they’re a bit ‘more cheerful’ than he had hoped for, but when looking from the rooftop out to sea, they take on the same sheen as the turquoise waters beyond so that the gallery and landscape become one.